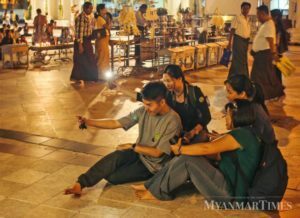 Asian tourists take selfies at the Shwedagon Pagoda in Yangon. Myanmar’s tourism sector has borne the brunt of the Rakhine refugee crisis, with growth in tourist arrivals dropping to 1 percent in 2018 compared with 7.1pc in 2017, according to the World Bank. The number of western tourist arrivals fell the most, more than offsetting arrivals from Asia. The numbers reflect reports of booking and tour cancellations by western tourists since late 2017 after news of violence in Rakhine was reported on a global scale, The World Bank said. Tourism accounts for 2.7pc of the country’s GDP. Officials reckon the tourism industry will continue to come under pressure this year and for as long as the Rakhine crisis remains an issue. “Tourist arrivals from the west are expected to continue experiencing low growth this year and cannot be counted on to boost the tourism sector,” U Khin Aung Htun, vice chair of the Myanmar Tourism Federation told The Myanmar Times. U Kyaw Swa Min, managing director of Grand Lotus Tours Co is already bracing for another rough year. “Our company has been struggling because our target market is the West. The western tourism market will not be good this year, so we are restructuring our offerings for tourists from the east,” he said. “Now is time to attract as many tourists from the east as fewer western travellers are coming,” U Kyaw Swa Min said. To offset the west’s impact on tourism, Myanmar has doubled up its efforts to capture the tourists from Asia. Last year, the Ministry of Labour, Immigration and Population relaxed visa requirements for travellers from Japan, Macau, Hong Kong and South Korea. It now also offers visas on arrival to mainland Chinese and Indian tourists. Due to the easing of visa requirements for travellers from those countries, tourism businesses are hoping to see a 50pc rise in visitors from eastern countries this year. According to the Ministry of Hotels and Tourism, 3.2 million international visitors came to Myanmar between January and November last year, an increase of around 2pc compared with the same period in 2017. Of the total number of visitors, 38pc came from China, 7 pc from Thailand, 6pc from South Korea, 4pc each from India and Malaysia and just over 1pc from Japan. From January to November, 945, 022 Asian travellers visited the country, of which 261,896 were Thai and 259,592 were from China, according to government figures. Meanwhile, travellers from other regions, especially from western and European countries, have declined and will not reach the target of four million the ministry had projected for this year. “With the expected rise in the number of tourists from Asia, we hope to offset the decline in numbers from the west and see overall tourist numbers reaching 2016 levels. There will be an increase in travellers from ASEAN and Asian countries this year, especially China,” U Khin Zaw, the adviser to the Ministry of Hotels and Tourism, told The Myanmar Times. The post Govt counting on Asian travellers to boost tourism appeared first on Mekong Tourism.